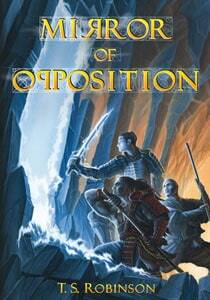 The first in what will hopefully become a long series of fantasy novels, Mirror of Opposition, by T.S. Robinson, tracks three young friends who are blown apart from each other by the actions of the book’s initial villain, and must struggle singly to overcome obstacles all at once physical, spiritual, and philosophical in nature. One friend finds himself in the belly of the beast, and must embrace the wickedness of his circumstances for any hope of survival. Another finds himself among the defenders of the weak and innocent, set at odds with his previous friend. The third takes a middle path, leaning precious secrets and inadvertently exposing himself to something far worse than anything they have seen so far. Mirror packs plenty of sword-wielding, swashbucklery punch; there is more than enough action to keep the die-hard fantasy fan entertained here. But in the tradition of a Robert Heinlein (Starship Troopers) or a David Gerrold, (War Against the Chtorr) this is also a thinking man’s book, with broad examinations on the nature of good, evil, and the struggles that they produce. The value added to the reader from this is that while the author has created a fascinating world full of hidden implication and larger-than-life personality, he seems unafraid to explore the results of what he has set in motion, allowing his world to break, sometimes immediately, in surprising and fearless ways that will keep your attention and interest. A single caveat: this book does read like the opening chapter to a much larger experience. It will make you want more. The writing is deft, the characters well-thought out, and at the end you will be ready for the next one. I certainly am.